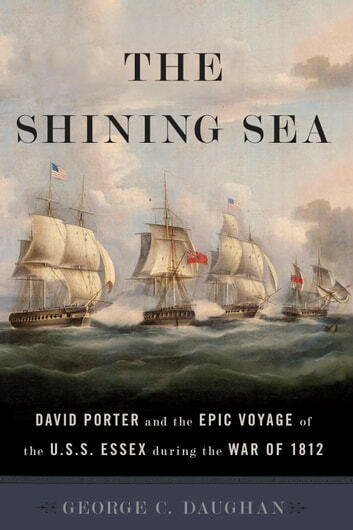 A few months after the outbreak of the War of 1812, Captain David Porter set out in the USS Essex on an epic, seventeen-month cruise to the South Seas. 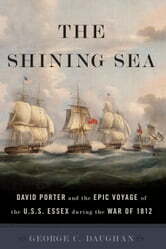 Porter was pursuing fame and riches, and by most accounts his odyssey was a stunning success: it brought glory to the fledgling American navy, cemented Porter's reputation as a daring and talented commander, and has long been celebrated as one of the greatest maritime adventures in U.S. history. Less well known, however, is the terrible price that the crew of the Essex paid for their captain's outsized ambitions. In The Shining Sea, award-winning historian George C. Daughan tells the full story of Porter's thrilling, action-packed voyage, revealing the heights of Porter's hubris and the true depths of his failure on this fateful cruise. Intent on achieving personal glory, Porter made the treacherous journey around Cape Horn and into the Pacific Ocean, where he planned to capture a British man-of-war. From Valparaiso to the Galapagos to the Marquesas, the Essex roamed the South Seas, seizing British whaling and merchant ships, wreaking havoc on British commerce, and earning Porter and his men wealth and acclaim. Flush with his victories, Porter welcomed the news that a British frigate-the HMS Phoebe-was on his tail, and he resolved to capture her. But Porter could not overcome the Phoebe's superior firepower. Over the course of a desperate, bloody battle, he lost the Essex and over two-thirds of her crew-a shocking end to a daring journey. A swashbuckling tale of risk and ruin on the high seas, The Shining Sea brings to life the monomaniacal quest of one of the most misunderstood commanders of the War of 1812. Porter's singular voyage, Daughan shows, stands as a cautionary tale for any leader who would put personal glory and ambition ahead of cause and countrymen.